Home » Historical Gaming » Sword & Spear – the Holy Grail of Ancients rules? Sword & Spear – the Holy Grail of Ancients rules? I don’t know about you, but I’ve never been 100% happy with many of the Ancients rulesets that I’ve played over the years, bearing in mind that I’m looking at rules in which you play with element based armies, as opposed to units comprised of individual models, so rules such as WAB, Clash of Empires and War & Conquest aren’t included in that statement (of these, WaC is probably my favourite of these). I was never a fan of DBA, DBM and FoG. Warmaster Ancients and Hail Caesar are OK – probably my favourites up until now were Augustus to Aurelian, Polemos: Ancients and Impetus. Given my gaming criteria I found myself constantly returning to playing ancient battles using Commands & Colours: Ancients, as this scratched the appropriate itch in the given timescale. 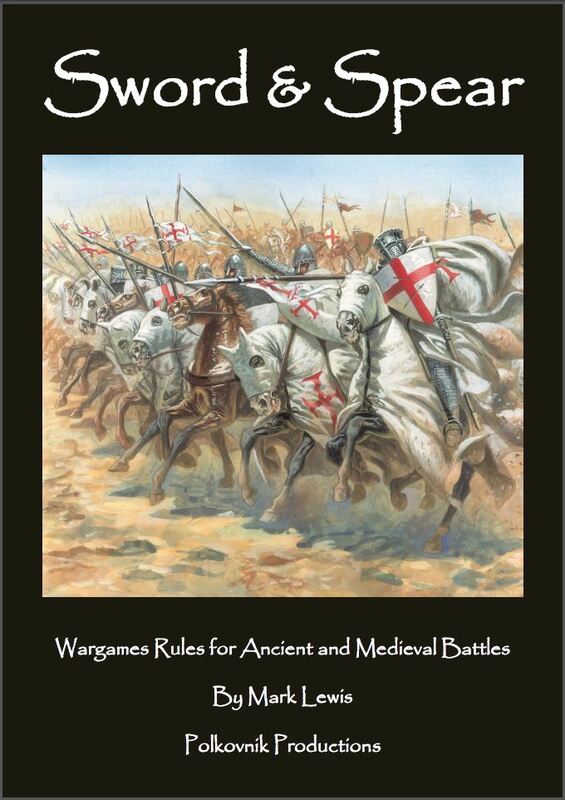 However, a new set of rules have come along which, even after a single play, have immediately become the favourite to be my Ancients wargaming rules of choice for the future: Sword & Spear, written by Mark Lewis and published by Polkovnik Productions. I tried them out with my regular gaming opponent, Dave Luff, last night. We played a simple meeting engagement on an open plain between Early Imperial Rome and Ancient Britons, just to try out the rules mechanics. It really helps that the rules made sense, so when we hit a situation, we discussed what we would expect to happen, and 99% of the time, the rules did what we expected. Whilst movement and combat works well (although some of the wording around combat bonuses could be better) the crowning glory of this game is the Command and Control system. which takes ideas from games such as Saga and Bolt Action, adds its own twists and produces a result which gives each player plenty to think about during the course of each turn. Dave (who is notoriously fussy and hard to please when it comes to wargames rules) was very impressed. I think we’ve just found our Holy Grail, Ancients rules that are fast, fun, intuitive and interactive to play (definitely not I-go-U-go), whilst offering a number of challenges and decisions in every phase of play. I think we will be playing these rules an awful lot in the future. In short – these are a great little set of rules! The rules are available for £6 as a PDF, or £14 for a print copy. At time of writing, there are 52 army lists to download, covering the periods of Biblical, Rome and her enemies, Greek and Macedonian Wars, The Middle East & Crusades, The Dark Ages and Medieval. All being well, I’m hoping to give an in-depth review of these rules and interview Mark Lewis on a podcast in the not-too-distant future. 18 Comments on Sword & Spear – the Holy Grail of Ancients rules? Those really sound interesting, I just ordered the pdf version… wouldn’t have discovered them without your review, thanks. Glad to hear you like the rules, Neil. I thought they would be the kind of rules that would appeal to you. Thanks for posting the mini-review. Hopefully we’ll speak soon. I’ve no idea how that Tweeter business works (I think I sent you one) as I was just about to give you a nudge on Sword & Spear, but here you are with finger on the pulse! Look forward to hearing your further thoughts:-). We too were contemplating C&C Ancients variation but this set meets our requirements better. thank you for this short review. Sounds very interesting. How many bases/miniatures does one need for a game? Daggerandbrush – each unit is 4 bases with a couple of exceptions. Large units (phalanx pikemen and gallic warbands for example) have 6 bases, for chariots and elephants we use just 2 bases. Frontages just need to be consistent, so any army already based for the likes of FoG will be fine. You can have as many figures as you like on a base really but visually 3 or 4 looks good with 2 per base for skirmishers to reflect their looser formation. We regularly game with 10-12 units per side, but you could certainly have more and it does support multiplayer. Typically around 8 – 15 units per side. How many figures per unit is up to you. Hi Mark. I just ordered a PDF. Will you be doing any early dark lists for Romano-British and Early Saxons? For Early Saxons, see the Germanic Tribes list under Rome & Enemies. I will be doing Romano-British, but not in the next couple of weeks, as I’m going on holiday tomorrow. I’ll make it first on the list when I get back. Bought these rules, played our first game, loved it. You can see our AAR at ytg.com.au. We will be playing a bigger Parthian vs Seleucid game tomorrow, and will post the report on the S&S forum. I’m looking for some medieval rules as well but I am seeking rules where I can have a unit of knights and 1 stand within the unit is the leader and fights better than the rest of his unit. Like a hero. I also need to find something I can convert to or can find a mod to play solo. Ideas?